It is located on Aynali Bakkal Street at Mevlanakapi. It was constructed on the order of Haci Mahmut Efendi for his own name. Haci Mahmut Efendi was the son of Sheikh Abdurrahman Efendi who was the founder of Karabas Mosque in Hirkai Serif. The exact date of the construction is unknown but if the years when its constructor lived was taken into account then then we could say it must be somewhere around the second half 17th century. The minbar was installed on the order of Topal Ayse Hatun. The plan is in rectangle, the roof is wooden and masonry and the walls are in brick with rubble stone. The last congregation part is under the same roof and it has two exterior mihrabs. The ladies section, the rostrum and the minbar is wooden. The mihrab of the mosque is very plain and it was built from gypsoplast. The minaret is not very high, its plastered and its cap is coated with lead. 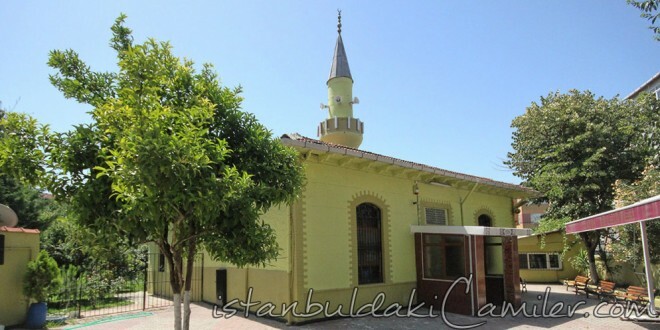 The first person to have the mosque renovated was Sadik Efendi and after him in 1903 II. Abdulhamit Han renovated the mosque again by extending it and preserving its originality.